A newly launched media system by Thermo Fisher Scientific has been designed to enable reliable and biologically relevant in vitro neuronal cell models by increasing survival of neurons by more than 50 percent compared to conventional products. The new Gibco B-27 Plus Neuronal Culture System, comprised of B-27 Plus Supplement and Neurobasal Plus Medium, allows neurobiology researchers to replace current neuronal cell culture supplements and basal media to maximize survival of neurons in short and long term cultures without having to change workflows. Since 1993, the Gibco B-27 Supplement and Neurobasal Medium has been the trusted standard for a variety of neuronal culture applications, with citations in more than 11,000 publications. Recent enhancements to the Gibco B-27 Plus Neuronal Culture System provide an advanced formulation, an upgraded manufacturing process, and stringent quality control measures to reliably maximize survival and health of neurons in vitro. Available in the same formats that customers have relied on for years, the B-27 Plus Neuronal Culture System includes both the 50X, 10 mL B-27 Plus Supplement and the 500 mL Neurobasal™ Plus Medium and can seamlessly replace previous neuronal cell culture systems, including the original B-27 Supplement and Neurobasal Medium. The Gibco B-27 Plus Neuronal Culture System and the Gibco CultureOne Supplement, which launched last November is designed to optimize neural stem cell differentiation into neurons and are the latest additions to Thermo Fisher’s neurobiology product portfolio. 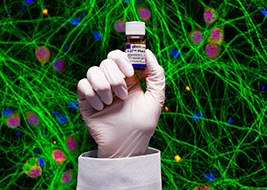 For researchers who are either maintaining primary rodent and human pluripotent stem cell (PSC)-derived neurons or differentiating human PSC-derived neural stem cells to neurons, the combination of the Gibco B-27 Plus Supplement, the Neurobasal Plus Medium, and the CultureOne Supplement removes the challenges of culturing neurons and enables an improved downstream experience. The Gibco B-27 Plus Neuronal Culture System and Gibco CultureOne Supplement are for research use only.